Wrestlemania is over but the (should be) main event is just getting started! In one corner, we have Antonio Brown, the babyface turned heel. After years of helping you win Fantasy Football championships and making fans proud, he gave us one last gift: one of the greatest heel turns of all time. One up there with the likes of Seth Rollins smacking Roman Reigns with a chair or Hulk Hogan going Hollywood. This heel is no longer holding back or biting his tongue and no one is safe. He has been undefeated for years reigning atop his division (err… position). In the other corner is the ultimate babyface. One who to get over let’s say played football with kids at a mall, plays Fortnite and is just awesome on Twitter. This doesn’t sound familiar at all right? The two now have cut plenty of promos… or went after each other on social media. By now I hope you realize the big matchup I am talking about is Antonio Brown (the heel aka bad guy) against JuJu Smith-Schuster (the face aka good guy). The two will not meet on the gridiron, but they will be debated in Fantasy Football drafts. That is where they will really battle it out. Who will come out on top? Well, to figure that out let’s take a look, both at their individual performances and their QB play, to come up with projections for each. Brown has topped 1,250 receiving yards in six straight seasons. In that span, he has averaged 1,524.2 receiving yards per season. He has topped 100 receptions in every one of those seasons and has scored at least eight touchdowns every year, including 10 or more in four of them. He had a career-high 15 touchdowns in 2018. Last season was the first time he did not finish as a Top-3 WR in PPR since 2013. He finished as the WR5. His individual performance makes him an early favorite in this clash, but let’s see how his QB play fairs. Derek Carr is no Ben Roethlisberger. Carr threw for a career-high 4,084 yards in 2018, something Big Ben has topped in consecutive years. But what matters more are the top WRs under Carr and the numbers they have put up. The most receptions a receiver has ever had with Carr was Michael Crabtree with 89 in 2016. The most yards were Amari Cooper with 1,153 in 2016 (2016 was a good year for Carr). As for the most touchdowns… it was Crabtree with nine in 2015. That’s right, the most yards and receptions a receiver has had is fewer than any season Brown has had in the last six years. The most touchdowns ties the second-fewest Brown has scored in a season since 2013. The average season of Carr’s top wide receivers looks like this: 144.4 targets, 73.6 receptions, 867 yards and 6.8 touchdowns (2018 dragged that number down). To elaborate, I took the most a wide receiver has finished with in each category. I did not just take the WR1 and find their average, I mixed and matched to get the highest possible numbers. And they still aren’t that impressive. However, it is important to state that Carr has never played with a wide receiver as talented as Brown. Using both Brown’s average season and the top numbers with Carr you can project Brown to finish with something like 155 targets, 92 receptions, 1,200 yards, and 9 touchdowns. That would be the most targets, receptions, and yards for any WR with Carr and tie for the most touchdowns. This is also giving AB the benefit of the doubt that he won’t fall off even harder in his first season. If these seem aggressive to you, you will not be ending up with any shares of Brown this season. Using those projections, Brown would give him 266 PPR points, which would be by far the fewest PPR points he’s scored in a season since 2013. Currently, his worst season in that category is 307.3 PPR points in 2016. Using 2018 as a benchmark, he would have finished as the WR11 in PPR with those numbers. JuJu Smith-Schuster has a significantly smaller sample size than Antonio Brown does, as he has been in the league for just two seasons. While he was plenty impressive in his rookie season, it is his sophomore year that we should really focus on. Seeing WR1 like work, JuJu was able to finish with 166 targets, 111 receptions, 1,426 yards, and seven touchdowns. For his projections, I want to do them a little differently. He does not have a large enough sample size, and all of Roethlisberger’s top WR numbers will just be using Brown, which I also don’t think is a fair way to measure. Instead, let’s take a look at the Steelers offense. Last year, they led the NFL in pass attempts with 689. While that number is the most they have had in a while, the Steelers have attempted 590-plus pass attempts in every season since 2014. So let’s say they throw 600 times this season. Antonio Brown consistently saw over 150 targets and averaged about 165 in the last two seasons. If they were to throw 600 times, 165 targets would equate to about 27.5 percent of the team’s targets. Meaning that with Brown’s departure alone, there is over a quarter of the team’s targets up for grabs. It will not all go JuJu’s way, plus I am projecting there to be fewer passes attempted. Let’s say that JuJu sees a modest five percent increase in production with AB now out of town. If he sees a five percent increase across the board he would finish with: 174.3 targets, 116.5 receptions, 1,497.3 receiving yards, and 7.3 touchdowns. If that was to hold true he would finish with 308 PPR points. That would have ranked him as the WR8 in 2018, which ironically he finished as anyway! However, the touchdown progression seems low. I think he could have significant gains in this department, as Brown had a league-high 22 end-zone targets. In fact, he had 40.7 percent of the Steelers end zone targets. Smith-Schuster on the other hand, had 14 end zone targets, which equated to 25.9 percent. Let’s say JuJu finishes with 18 end zone targets, smack in the middle of his and Brown’s totals from 2018. You would imagine that the additional four targets lead to at least one, maybe two additional touchdowns. If you give him one additional TD he moves up to the WR7 (using 2018 totals) and if you give him two he moves up to the WR6. Whichever touchdown total you want to give Smith-Schuster it does not matter. Either way, the projections have him being the heavy favorite to outproduce Brown and win this feud. 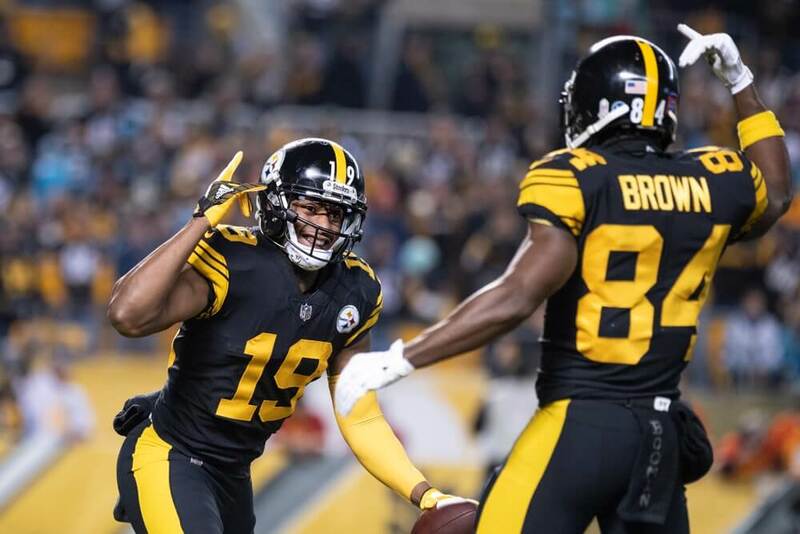 Without adding onto his touchdown total from 2018, JuJu is projected to outscore Brown by over 40 PPR points! This rivalry will end much like Daniel Bryan’s journey in 2013, when he overcame the odds and beat the authority. 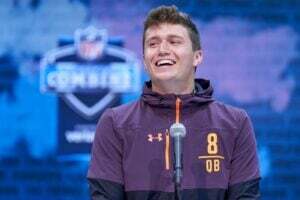 Only, in this sense, it will be the owners that draft JuJuSmith-Schuster over Antonio Brown covered in confetti and celebrating!